I am not sure how it happened, but it seems that up until now there has been a misrepresentation of our eating habits on this blog. Our middle son, Ewan, is a mac and cheese fanatic. Yet somehow I have never posted a mac and cheese recipe, how is that possible?! Trust me, we make our share of mac and cheese in this house. It also happens to be the case that I rarely make the same mac and cheese. I experiment with different cheeses or use all kinds of add ins. I like to toss lots of goodies into the mac and cheese so I can have a full meal in the one dish. So today I bring you a recipe for mac and cheese with crab and broccoli, in honor of Ewan, my crab loving mac and cheese boy! Broccoli is probably my favorite vegetable to add into mac and cheese. All you need to do is boil it for a couple minutes with the pasta, how easy is that?! Then of course it had to be crab meat. Ewan absolutely loves it, as does everyone else in the family. Cheese is another issue to consider. We all love a traditional mac and cheese with cheddar cheese, but this one called for something else. I decided the smoked gouda would be perfect with the crab and I was definitely right. This may be one of my favorite versions of mac and cheese yet. The boys certainly loved it too, especially in a thermos for their lunch the next day! Like most mac and cheese recipes this one just requires you to cook the pasta to al dente, make a cheese sauce and mix it all together. The magic happens when you bake it with panko bread crumbs on top. I just love that crunch from the top layer, then the cheesy creamy goodness of the sauce. Add a fresh salad and you have a meal ready to go. This is a great dish for large family gatherings, potluck meals, or three piggy boys and some leftovers for school lunches! Preheat oven to 350 degrees and butter a large casserole dish. Bring a large pot of water to a boil, add macaroni and cook to al dente (time will depend on specific pasta used). Two minutes before the pasta is done add in the broccoli. When it is done cooking drain all the water. In the meantime, while the pasta is cooking start the cheese sauce. In a large and deep skillet melt the butter and whisk in the flour. Cook for three minutes, stirring constantly. Add the ground mustard and cook for another minute. Slowly pour in the milk, whisking to avoid any lumps. Simmer for 10 minutes and then tempter in the egg (whisk the egg in a small bowl and add a tablespoon of the milk mixture, stir, add another tablespoon etc until you’ve added about 1/4 cup and then pour it all back to the milk mixture) to avoid scrambling it. Whisk in the smoked gouda until it is melted. Whisk in the cream cheese until it is melted and combined. Stir in the crab meat, salt and pepper. Add the macaroni and broccoli and stir until it is all coated in cheese sauce, pour into prepared pan. Combine the melted butter and panko crumbs, sprinkle on top. Bake for 30 minutes, until hot and bubbly. Let it rest for about 10 minutes before serving. This entry was posted in Pasta and tagged broccoli, easy, kid friendly, smoked gouda on February 24, 2015 by Gretchen. Oh that looks yummy!! I love Broccoli, and fancy cheese! Broccoli is probably everyone’s favorite veggie in our family! What’s not to like, comforting mac and cheese with crab?! Certainly a favorite in our family! wow–this looks like something I’d like lots, but not sure about my kids. Always amazed at how open minded your boys are. Having some serious carb and crab cravings right now!!! This nasty winter weather has me carving carbs too! I could go for some mac and cheese now. When is spring coming?! As fir crab, we could all eat it every day of the week, oh yum! Thanks, it was very delicious and didn’t last too long! Crab definitely takes mac and cheese to a new level! Gretchen great minds think a like!! I have a class in a few weeks and we are featuring “crab cakes’ what can you do with the mixture beside make them into patties and fry it, well I was going to mix into Mac & Cheese!!! I love your recipe!!!! 🙂 Too funny, we are on the same path my friend!! Cheers!! I love hearing about what your sons’ like to eat! We also love nice cheeses around here. 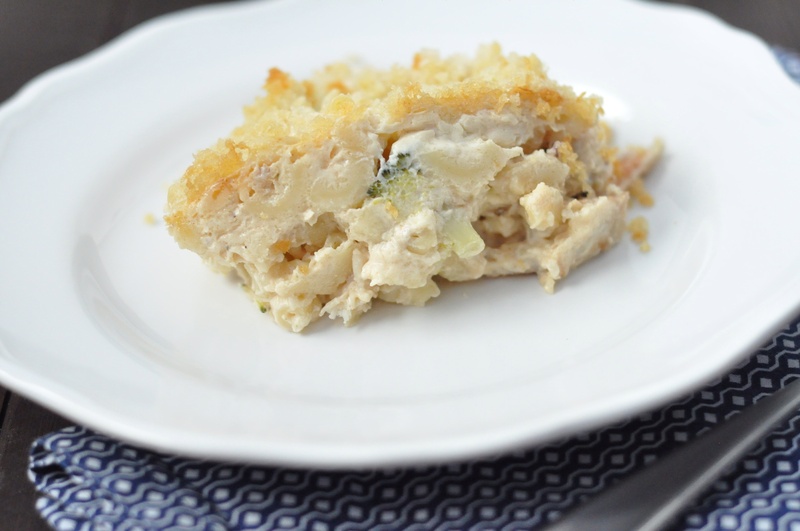 You could make this for kids – or put it in individual gratins for a dinner party. 🙂 Truffle cheese and truffle butter with mushrooms – with any chopped, fresh herb – are a favorite and would work in your versatile recipe. And nice call on those crunchy crumbs. 🙂 I love your blog because we have such similar tastes and your recipes are always spot-on. Cute pics of the 3 Sons! Super adorable, Gretchen. I love them in individual servings as well! Truffle cheese is also great, pesto gouda too, goat cheese….so many cheeses out there!